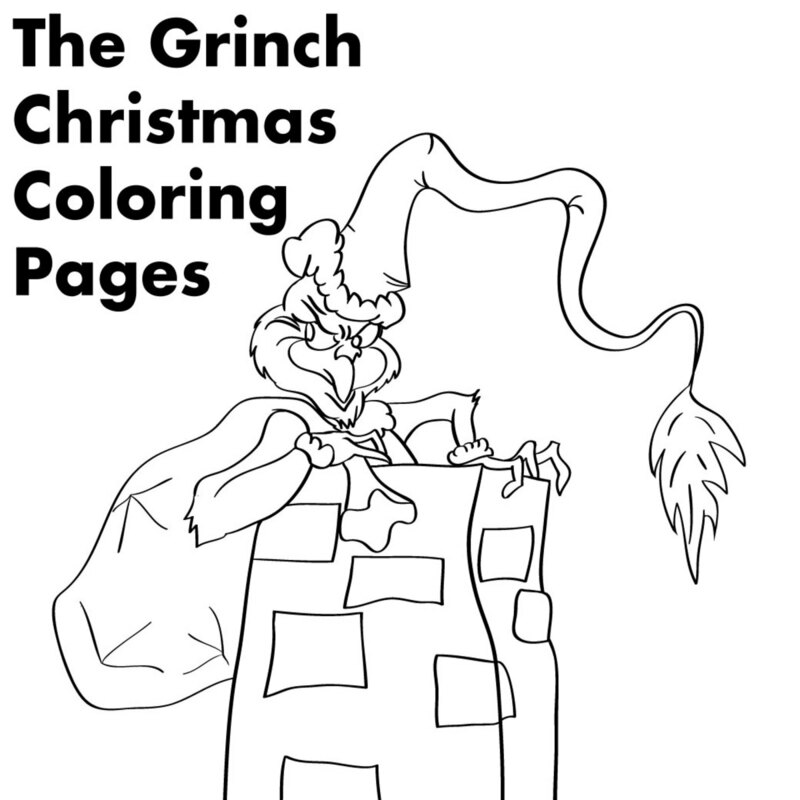 Festive coloring pages are a fun way to bring family and friends together in an easy activity. 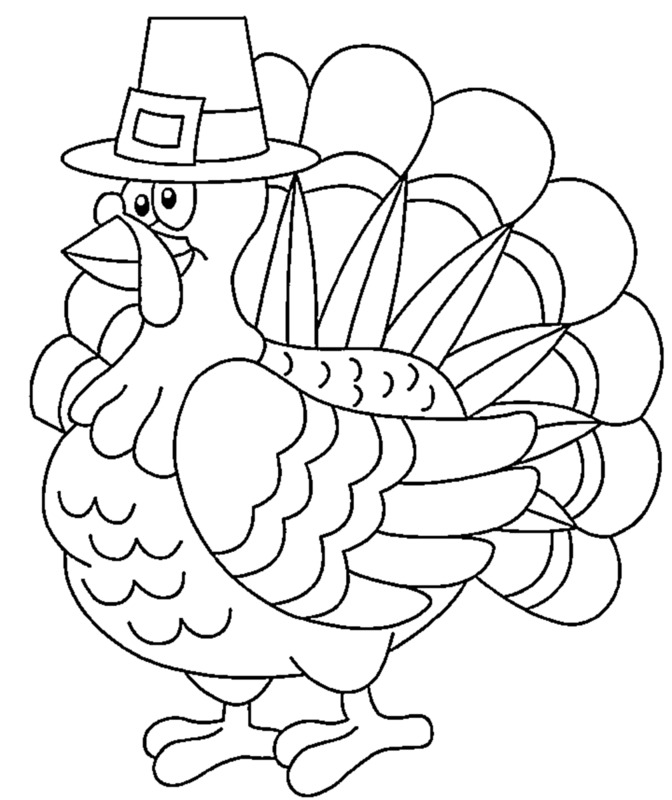 Thanksgiving-themed coloring pages are a great activity chidlren can do while interacting with holiday themes. These printables range from very simple to complex, making them easy to tailor to kids' ages and skill levels. To download the pages, just right-click the image and save it as a file on your computer. Send it to the printer, and voila! You can create a coloring book for each guest or lay out all the options for kids to choose as they color. 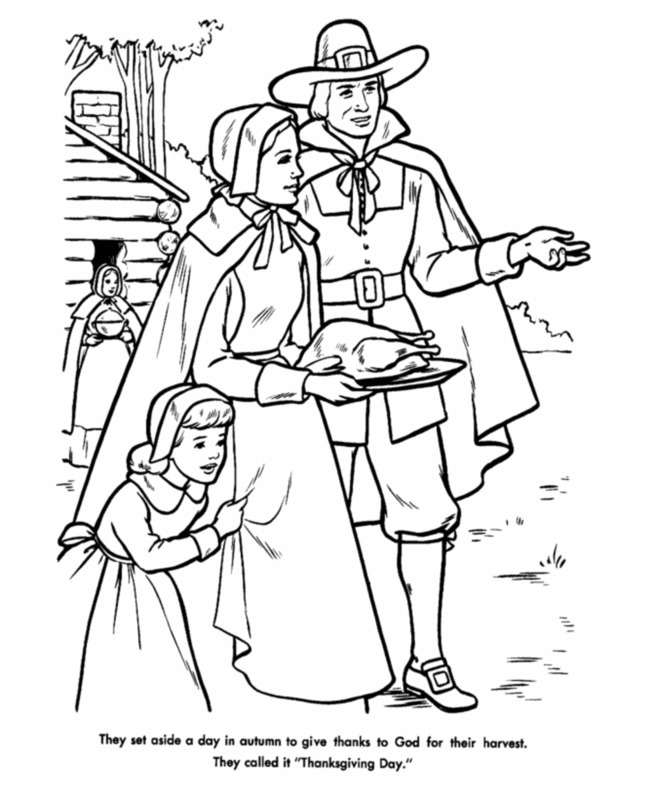 The Mayflower is my favorite Thanksgiving printable because it carried some of the first pilgrims to the New World. 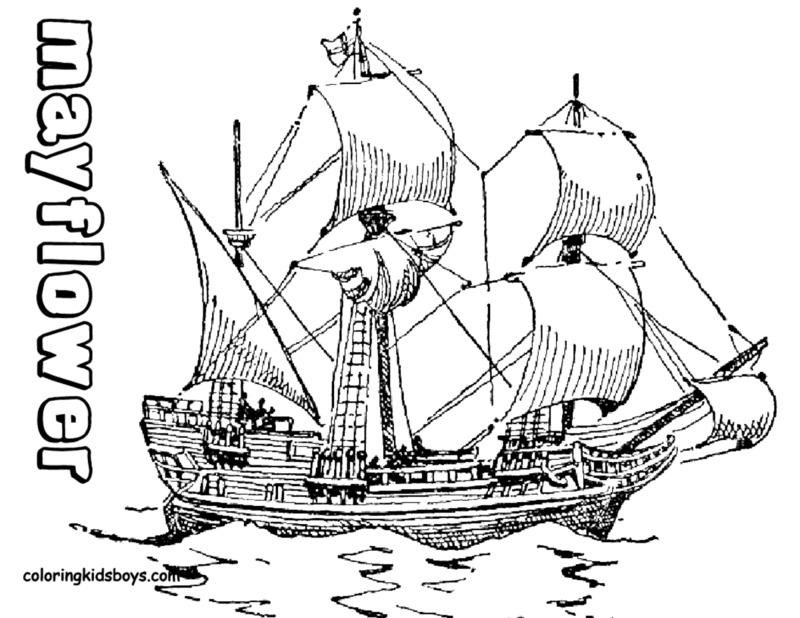 This portrayal of the Mayflower is designed beautifully and works as a terrific coloring page to help children think about when immigration to America began. Even though we expect the sails to be white and the ship to be brown, let the kids color in the shapes however they please. The ship is very detailed and could challenge older children to color within the lines and use different colors. This first turkey printable is perfect for kids who are just starting to stretch their artistic wings (pun intended). The design provides enough leeway for beginners to color outside the lines and ensures the final product still looks great. 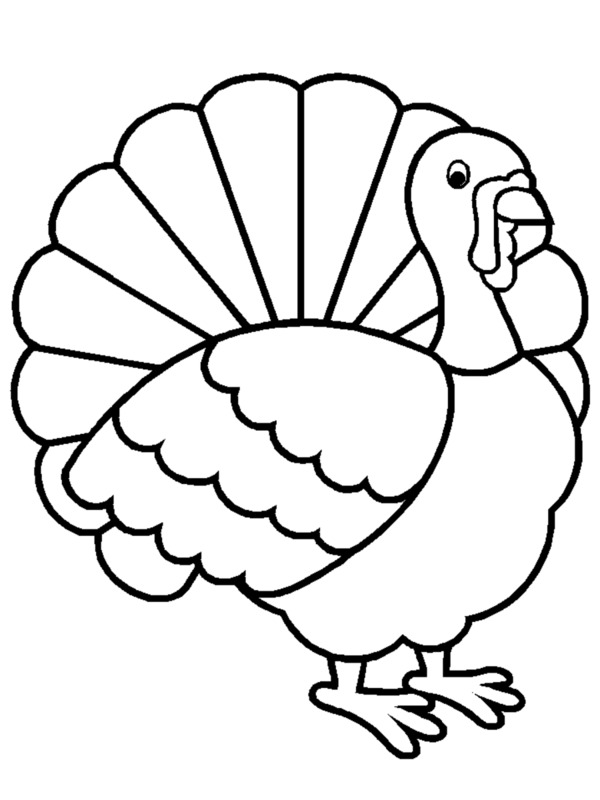 Having this printable with the next, more complex turkey design can help you prepare appropriate coloring material for kids of different age groups and abilities. This turkey dressed as a Pilgrim has a little more detail. He's a fun image that the kids can use to experiment with different color patterns. Don't leave out the adults just because this involves coloring! Both turkey printables are a fun choice for grown-ups who want to join the fun. 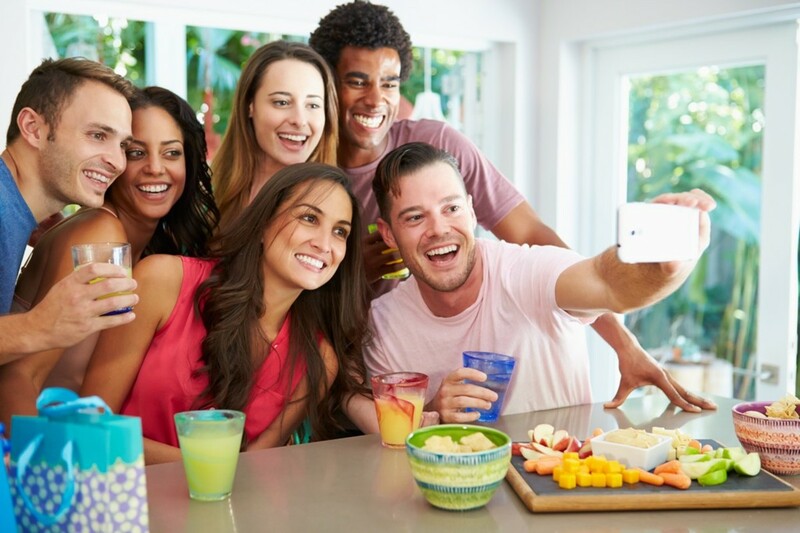 The colored pages can be incorporated into the party décor and add a fun, personal touch to your festivities. What is Thanksgiving without a turkey dinner? 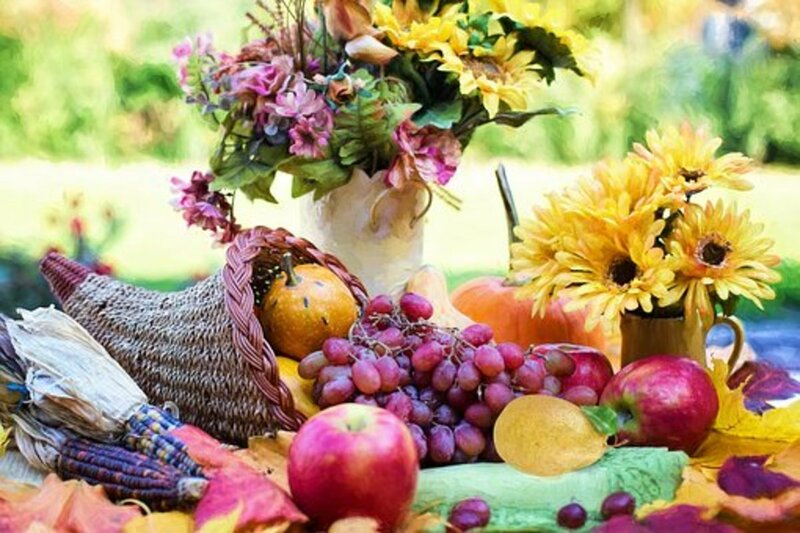 The holiday traditionally commemorates the pilgrims' first harvest after being taught how to work the land by Squanto, a member of the Pawtuxet tribe, and the Wampanoags. The original celebratory feast lasted for three days and involved various hunting expeditions. 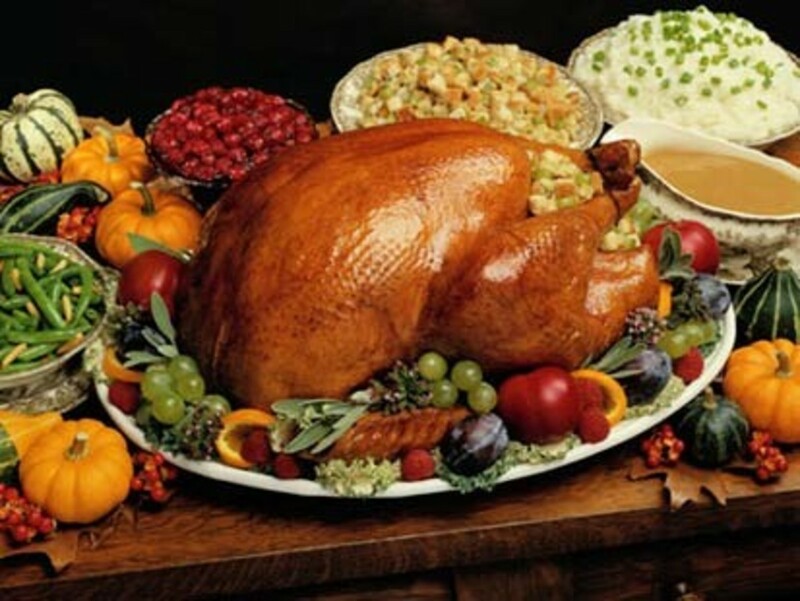 We don't know for certain if turkeys were on the menu, but the American fowl is now the main dish of the Thanksgiving meal. This Charlie Brown coloring page is a lot of fun and great for kids of all ages. 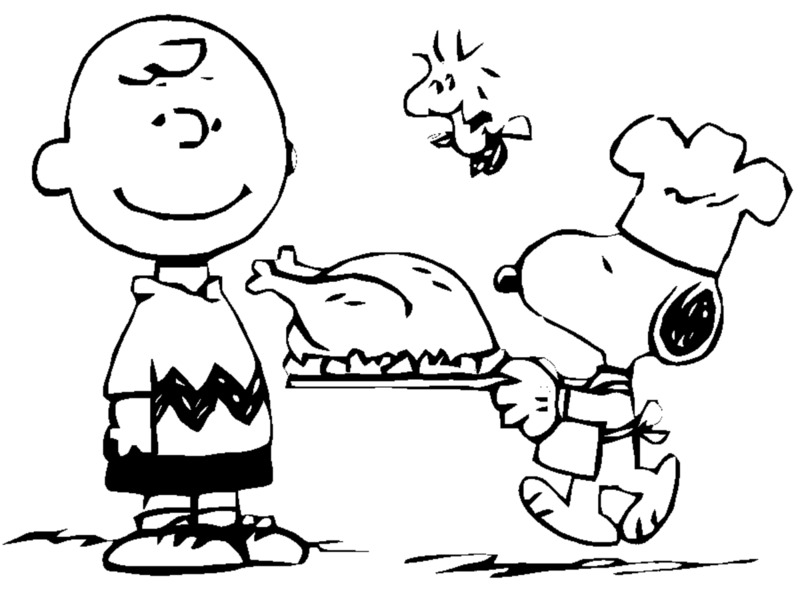 Snoopy, the chef, has come from the kitchen to proudly present the turkey dinner to a smiling Charlie Brown. In the second Thanksgiving dinner printable, a family carries out the turkey to share with everyone. The little girl clings to her mother's dress in excitement and shows the anticipation for the feast. 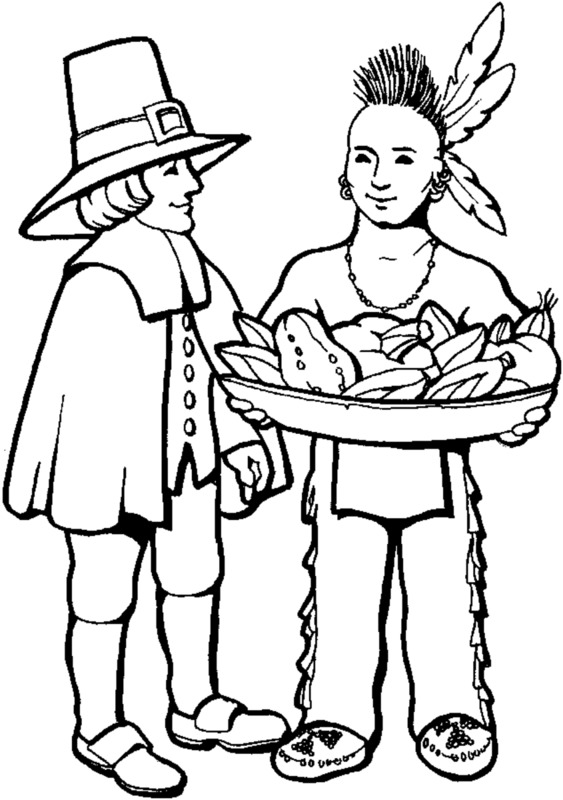 The first Thanksgiving was a gathering of Pilgrims and Native Americans, and these coloring pages can aid the discussion of the holiday's history. 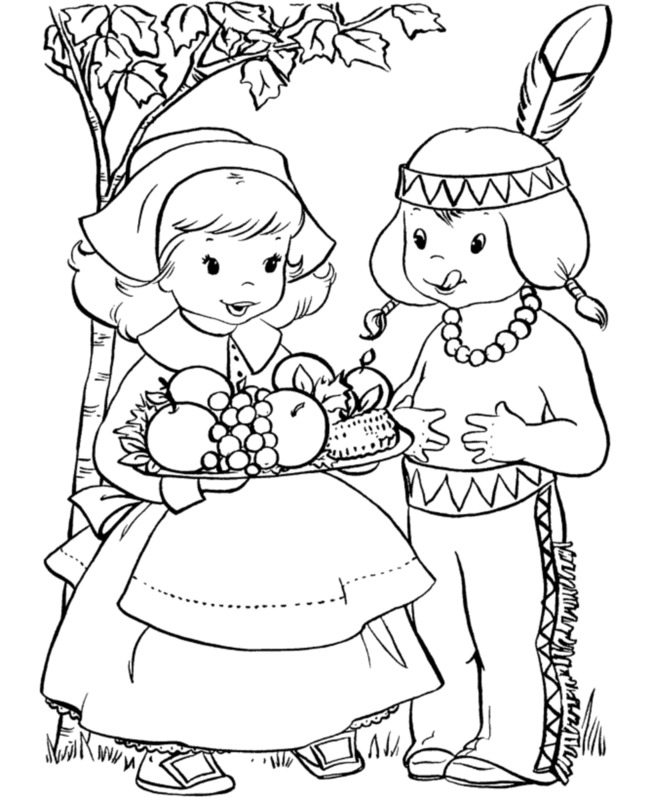 The printable of the Pilgrim girl and Native American boy is sure to intrigue the children and help them ask questions about the history behind Thanksgiving. 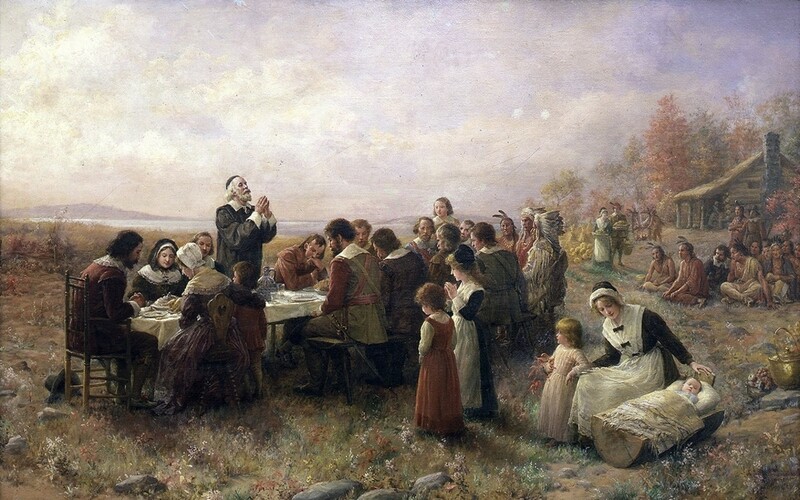 A grown-up variation of the prior image shows both the Native American and Pilgrim adults looking eager to dive into the feast. The details and different objects in this coloring page can encourage kids to use many different colors. Thanksgiving printables are a terrific way to involve kids and adults in the holiday festivities as they wait for the turkey (or ham) to arrive. 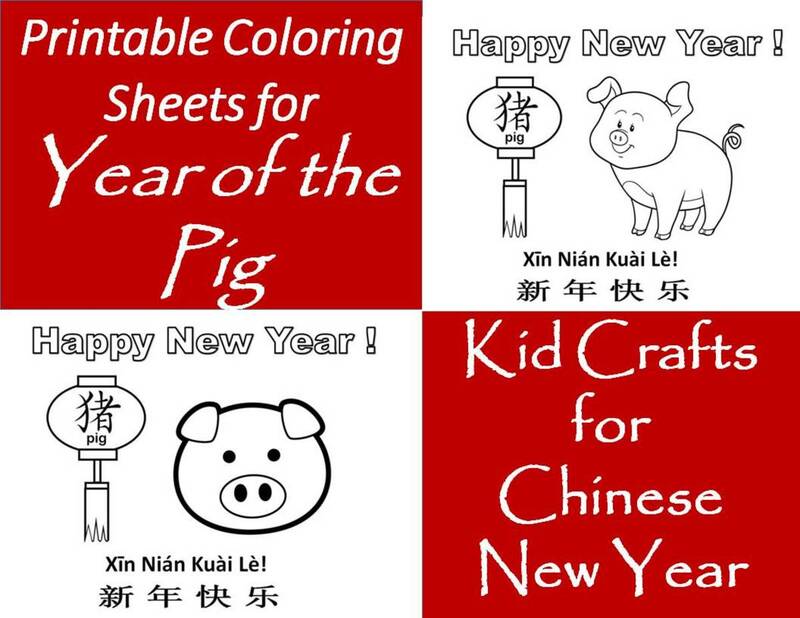 What's great about these coloring pages is knowing you'll never run out of designs and options for your little ones. 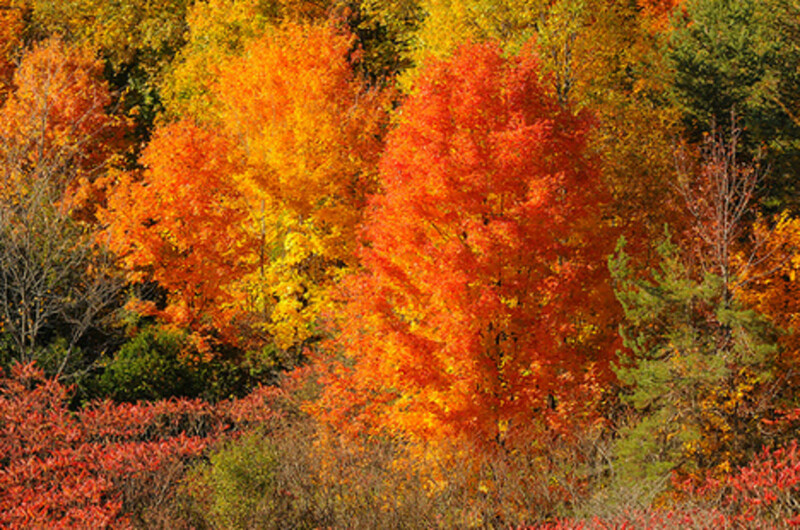 Once a page is finished, you can quickly find another to continue their artistic entertainment.